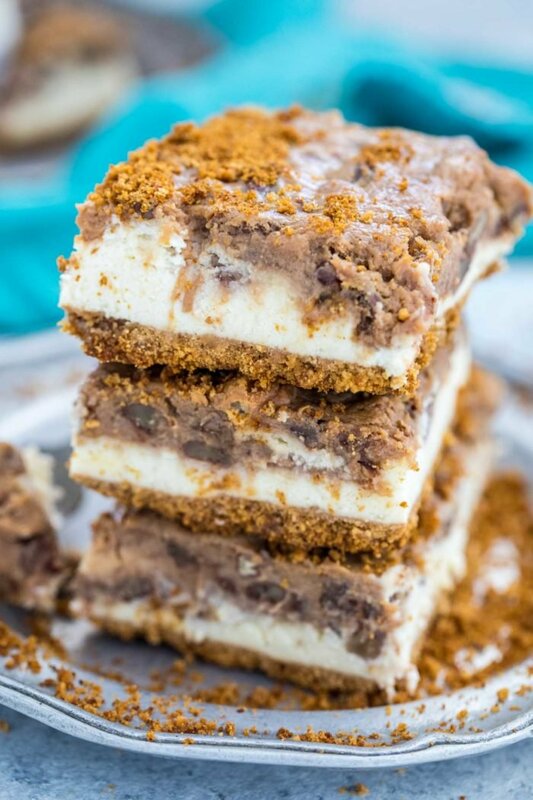 Pecan Pie Cheesecake Bars are a decadent dessert made of a thick and creamy cheesecake layer topped with the most delicious homemade pecan pie filling. Making cheesecake may seem intimidating, but it is actually one of the easiest desserts you can make. Two favorites are the Brownie Bottom Raspberry Cheesecake and the perfect for spring, Blueberry Lemon Cheesecake. Pecan Pie Cheesecake is one the easiest and fool-proof recipes you can get. 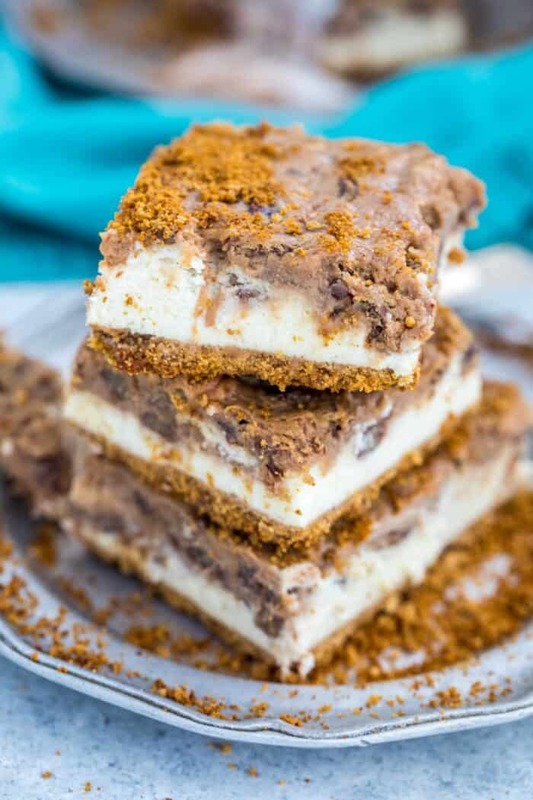 We love making this dessert into cheesecake bars because they are easier to serve and store. Usually a cheesecake will form cracks in the top while it bakes. 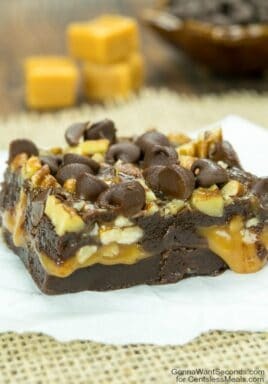 But by topping these pecan pie bars with the decadent homemade pecan pie filling, you will never need to worry about the cheesecake layer cracking. Pecan Pie Cheesecake Bars are the perfect combination of flavors and textures. 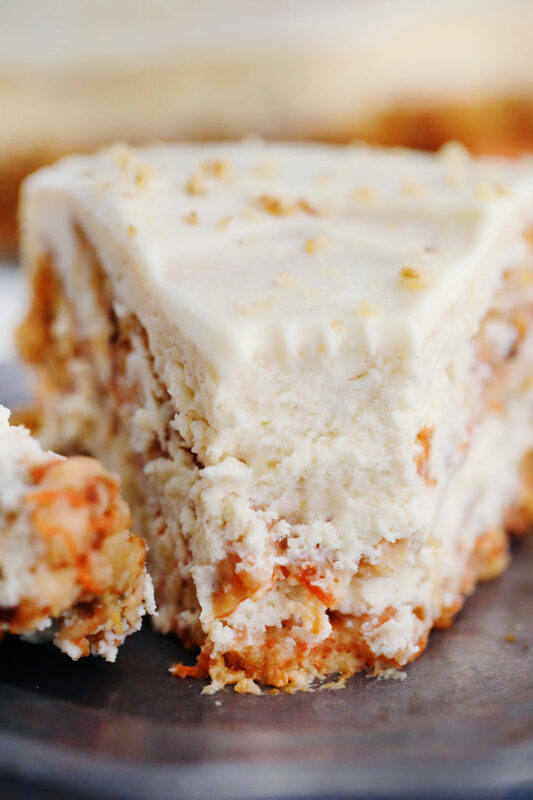 The creamy cheesecake is complementary to the sweeter and crunchier pecan pie layer. This festive dessert is perfect for any holiday or celebration. Can You Make Pecan Pie Cheesecake Ahead Of Time? 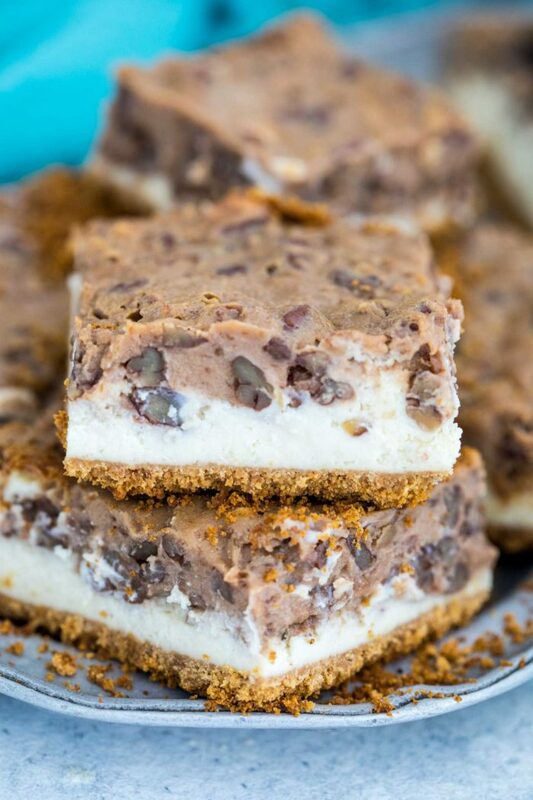 This Cheesecake Bar dessert is ideal to make ahead of time. You can prepare it and store it in the fridge for 2-3 days before you bake it. Also, you can simply bake it, chill it and store it covered in the fridge for up to 4 days. How Long Does A Cheesecake Take To Set? Once the cheesecake is baked, you have to cool it to room temperature before refrigerating it. Once cooled, cover the pan with foil and chill in the refrigerator for at least 6 hours, but preferably overnight for best results. Run a sharp slicing knife under hot tap water. Having a good grip on it, make the first cut without lifting the knife until you are done. Wipe the knife clean and run it under hot water again before making another cut. Repeat as many times as needed. Use a spatula to remove the first bar, the rest will come out easier. First, cool completely. Then transfer cheesecake bars to airtight, freezer-proof containers, or wrap tightly with aluminum foil and also with plastic freezer wrap. Freeze for up to 3 months. To thaw the cheesecake, place it in the refrigerator overnight. Instead of making the homemade pecan pie filling from scratch, use store bought filling. For the cheesecake layer, make sure all the ingredients are at room temperature for best results. If your pan’s sides are not very tall, try using only 2 packages of cream cheese. 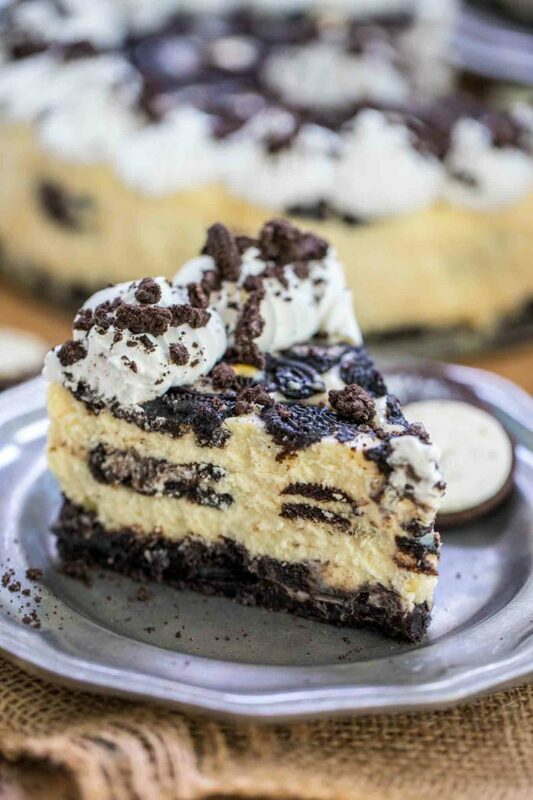 For an extra decadent dessert, make an Oreo crust for the cheesecake. This recipe works for a round cheesecake as well, but you will need a 10 1/2 inch springform pan. More Cheesecake Recipes To Try! Blueberry Cheesecake – so delicious! 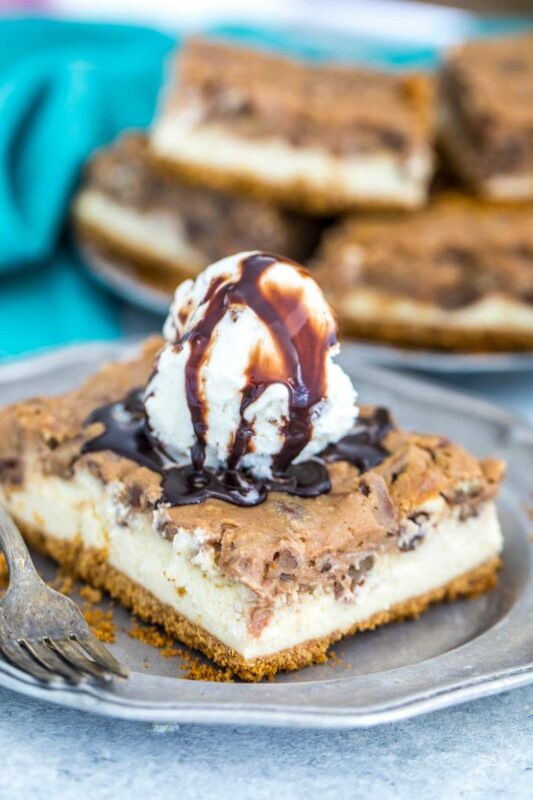 Chocolate Chip Cookie Dough Cheesecake Bars – easy and so fun! Pecan Pie Cheesecake is a decadent dessert made of a thick and creamy cheesecake layer topped with the most delicious homemade pecan pie filling. Lightly coat a 9x13 inch deep pan with baking spray and set aside. Press the mixture into the prepared pan. Freeze for at least 20 minutes. In the bowl of a stand mixer, beat cream cheese, flour, and sugar until light and fluffy. Add the eggs one at a time. Add the vanilla, cream and sour cream; beat until fully combined. Stop to scrape the sides and bottom of the bowl. Remove pan from the freezer and pour the cheesecake batter mixture onto the crust. Level the top with a spatula. Place a sauce-pan over low medium heat, add the brown sugar, cornstarch and salt. Mix for about 2-3 minutes. 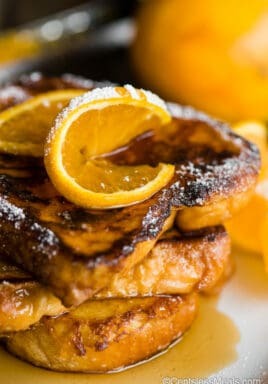 Whisk in the egg yolks, dark corn syrup and cream, until smooth. Stir and bring to a simmer. Reduce heat to low and cook until the mixture thickens, about 5-10 minutes. Stir occasionally. Remove from heat and stir in vanilla extract and cold diced butter until fully melted. Fold in pecans and let the mixture cool to room temperature. Once the cheesecake layer has settled, remove from the freezer and top with the pecan pie filling. Bake for 50-60 minutes, the top should be bubbly and golden brown. Transfer cheesecake to a wire rack to cool completely, after which refrigerate for at least six hours or better overnight. 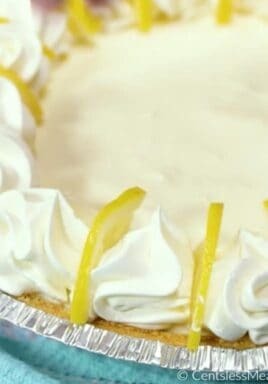 Creamy Lemon Pie recipe with only 4 ingredients!